Watch Don Racine and his son Dennis competing in this vintage car race made possible by HMSA (Historic Motor Sports Association) on this historic raceway. We have a variety of rebuilt gearbox options available for your Classic Mini. You can trust our decades of skill & experience and our technical knowledge with this important piece of your Minis DNA. Built-Up short blocks for the Classic Mini make maintenance and/ot upgrades very easy. Or factory original design connecting rods and competition 4-bolt center main straps for the crankshaft are just a few of the options from the leaders in Classic Mini parts. The Classic Mini Cooper from 1959 thru 2000 was sold with many different badges from the factory. The complete range of these emblems are not available at great prices from the largest US supplier of Classic Mini parts in the USA. The Mini has been a cultural mover and shaker since it's creation. Check out these Top 10 Cultural Moments in Mini History, from its racing background, to it's on-screen performances, to it's VIP status as the car-to-the-stars. 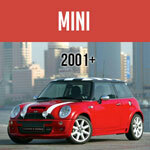 The Mini has played a major part in the history of modern culture. We've heard a rumor that car owners name their cars. We asked you and you answered. Check out the survey results here. Leave a comment and let us know what you have named your car! Mini Meets in Mexico are much like those in the US and UK ... except maybe for the cows. View some snaps from a recent meet in Morelia, sent by our friends to the south. Mini Mania offers you a wide selection of wheels, spare tires and wheel and tire accessories designed specifically for your MINI Cooper! The wheels and tires you put on your MINI are not only a critical function for your car but also a real design feature and a major factor in how it handles. Quick video about our assortment of MINI Cooper Spare Tires and storage bags. Specifications for Camber, caster and toe-in/out for both front and rear suspension of the 2002 thru 2007 BMW Mini Cooper. All drivers should know how important it is to change their oil during winter. And it should be changed more often. We asked and you let us know if you let anyone else drive your Sprite/Midget car. Find out the results to this fun driving survey here. New MINI car drivers, we asked and you let us know if you let anyone drive your car. Find out the results of this fun driving survey. Here's our selection of fuel system parts with new lowered prices. Here are our suggestions for prioritizing performance mods for your Classic Minis. 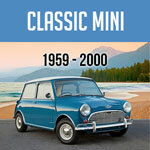 We've specialized in Classic Mini parts since 1974. Founded by a Mini race car driver, here at Mini Mania we know speed. Get ready for this Fall season with new brakes and lighting! Browse our selection of black badges and badge holders for your MINI Cooper! Grille and license plate holders available. Add extra dash to your MINI with the factory grille badge holder for the standard 3" grille badges. These instructions will have your grille showing off your style with just 30 minutes work. This badge holder fits 2007-2010 R56 MINI Cooper Hatchbacks and 2008-2010 Cooper CLUBMAN.